We’re not going to pretend that pulling off Thanksgiving dinner is a cinch. But you can make your life easier by planning ahead, breaking big tasks into smaller parts, and by keeping a checklist of what you have left to do. Use this T-Day Timeline to get a sense of what to do and when. You’ll be so organized that you may actually spend quality time with your family on Thanksgiving! * Look up recipes and create your shopping list, including what cooking supplies and utensils that you will need. * Raid cabinets for things that you may already have. * Write a cooking timeline that shows which dishes or components of dishes can be cooked in advance. * Determine what, if anything, guests are bringing. * Clean out the refrigerator and freezer. * Go shopping for everything except fresh produce, seafood and bread. * Thaw your turkey in the refrigerator. * Wash table linens, dishes, silverware, etc. * Confirm the final guest count. * Shop for fresh produce, seafood and bread. * Set the table, including bringing in extra chairs and table leaves. 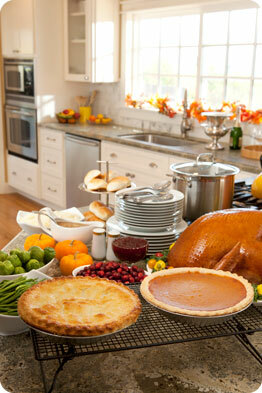 * Prepare anything that can be done in advance, such as pre-chopping vegetables or making pie crusts. * Season, stuff and cook your bird. * Make your side dishes. * Reheat pre-cooked food right before the meal. * Most importantly: eat, drink and enjoy! 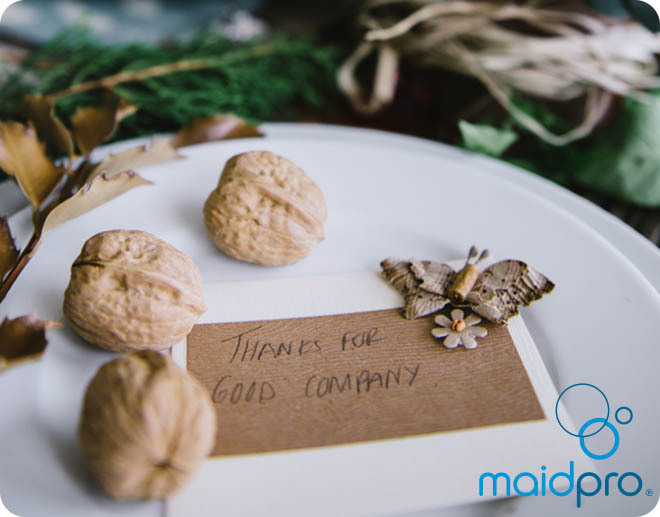 Happy Thanksgiving from your friends at MaidPro! One week before. Do a deep clean of your home one week before the holiday, so all you need to do is touch-ups in the days leading to the big event. Take the cleaning process step-by-step! For instance, clean the first floor one day, and the second floor on the following day, to keep from getting overwhelmed. A few days before. Pre-bake as many of your side dishes and desserts in the days leading up to the holiday as possible and store them in your refrigerator. Many dishes can be cooked, refrigerated, and given a final warm up just before the big meal with no loss of quality. Not only will you be less stressed on the big day, but all of the dirty dishes and flour-covered counters will also be behind you so you can finally enjoy the holiday as much as your guests. On Thanksgiving. The biggest mistake people make is leaving holiday meal cleaning to the end. If you wait too long, food gets stuck on dishes and counters get cluttered and soiled, actually making more cleaning work for you than if you cleaned throughout the day. Place pans that need to soak on top of your stove instead of in your sink. If your turkey pan is stovetop safe, you can actually simmer water in the roasting pan on the stovetop to loosen baked on drippings and ease cleaning.